As part of the national sesquicentennial commemorating the 150th anniversary of the Civil War, the Georgia Historical Society with support from the Georgia Department of Economic Development, the Georgia Department of Labor, Georgia Battlefields Association, the Georgia Department of Natural Resources, and other partners throughout the state collaborated on a project to use historical markers to promote tourism and create better access to Georgia’s Civil War history. By combining Georgia history, rural tourism, and online tools, the positive effects of the Civil War 150 Program will last long after the events are over. 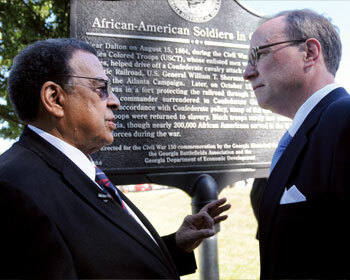 In the sixty years leading up to the sesquicentennial, the state of Georgia invested nearly $5 million in historical markers dealing with the Civil War, a considerable state asset that can be used to promote tourism and teach diverse audiences about the past. In 2008 GHS conducted a statewide survey of over 900 Civil War markers, noting their subjects, condition, and location. The survey revealed that fifteen percent of the markers were missing or damaged and further confirmed that over 90 percent of the existing markers dealt strictly with military topics, leaving vast segments of the Civil War story untold — with almost no markers describing the war’s impact on civilians, politics, industry, the home front, African Americans, or women. Following the survey, GHS recast and replaced seven missing markers detailing Sherman’s March to the Sea in their original locations along the route of that march across Georgia. Further, fifteen new historical markers that interpret previously unrepresented historical elements of the war were commissioned and installed throughout the state. The dedication ceremonies for these new and replaced markers took place from Dalton to Quitman and from Savannah to Columbus. Each one featured local and statewide leaders and highlighted the importance of telling local stories to help residents and visitors alike better understand the rich and complex history of Georgia’s Civil War experience. Throughout the course of these events, statewide and national media coverage made Georgia a focal point in the nationwide discussion over the ways in which all Americans remember and commemorate this most significant period in our shared history.